The motif of kneeling comes about in the oeuvre of Minne for the first time in the sculpture group Man and Woman Kneeling from 1889. Worthy of note is the vulnerability and the resignation of the figures, a position that we also find again in the illustrations that Minne made in the same period for the poetry collections of Serres Chaudes by Maurice Maeterlinck and Mon coeur pleure d'autrefois by Grégoire Le Roy. 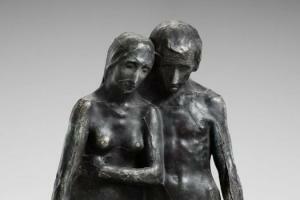 The sculpture group is also known as Adam and Eve and would then depict the moment of the subjugation after the Fall. Minne, however, departed from the existing biblical iconography in order to bring to expression general human feelings of suffering and mourning. In his sketchbook from circa 1894-1896, we see how Minne further developed the motif of kneeling and searched for the ultimate position as the externalisation of a complex emotional condition, in which self-protection, internalisation and narcissism blend together. The sketch pages show various kneeling figures: youths, a kneeling pair, mourning figures and John the Baptist, which he further worked out into a sculpture in 1895, of which the Museum for Fine Arts Ghent possesses a plaster and bluestone version. In that sketchbook are also a few drawings of youths to be seen as immediate preparation for Small Figure Kneeling from 1896, the prototype of Minne's kneeling youths. Already in that sculpture is the typical attitude established of the kneeling ones around the fountain: a youth with bowed head, kneeling on a block, with the arms crossed over the chest, while the hands embrace the shoulders. 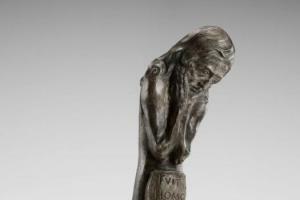 According to reports, for the Small Figure Kneeling stood "a delicate young Flemish model with a John the Baptist face". 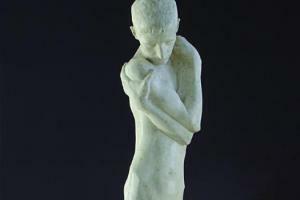 From the sculpture versions in plaster, bronze and marble exist. 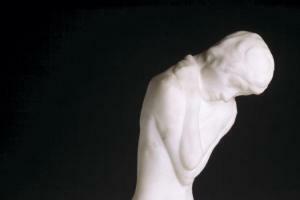 Both the Museum of Fine Arts Ghent and the Museum of Deinze and the Leie Region have a marble version of the Small Figure Kneeling. Also for the Fountain with Kneeling Youths from 1898-also called the Narcissus Fountain-there are a large number of studies known, both for the kneeling figures as well as for the supporting water basins. In his studio in Vorst, Minne made five different versions for the water basins in plaster. The first version he exhibited in the spring of 1899 with the art circle La Libre Esthétique in Brussels. In 1900, he showed a second version in the Wiener Secession. In photos from the exhibitions in Budapest and Venice we see a basin with only four instead of five kneeling figures. On the marble version in the Folkwang Museum in Hagen-made circa 1900 and ordered by the German mecenas Karl Ernst Osthaus-the plinths of the sculptures stand erected on the flat edge of the basin. In the version of the Museum of Fine Arts Ghent, the plinths are integrated plastically into the entirety of the basin. 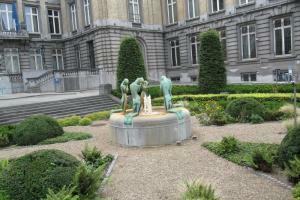 The water basin of the Ghent version is from circa 1927-1930; the kneeling figures themselves date from circa 1905. Various versions of the youthful figure also exist: at the Wiener Secession the kneeling figures have out-stretched feet on the plinths, which sink into the basin itself. In all other versions the plinths stand on top of the basin and the feet lie bowed over the edge of the plinth. As with the majority of the works from Minne's Symbolist period, the meaning of the Fountain with Kneeling Youths is also not simple. 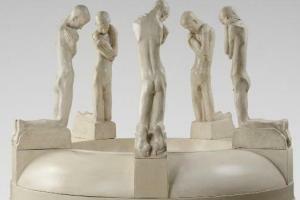 The decorative rhythm of five identical, turned inwardly, delicate youths, keeling around a water basin, gives the work a certain lightness and at the same time enhances the inwardness of the figures, the emphatic turning away from the outside world. With the water basin Minne possibly refers to the demi-god Narcissus who fell in love with his own mirror image and perished from it. We can interpret the sculpture group, however, also in a religious sense. The water basin than suggests the Source of Life such as we also find in the Ghent Altarpiece of the brothers Van Eyck. A small study of a pulpit with a sketch of the Fountain with Kneeling Youths at the foot of it shows how Minne situated The Fountain, perhaps initially, in a liturgical context. The nakedness of the figures suggests, however, broader and more universal meaning in which budding sexuality and narcissism clearly play a role in addition to mystical experience. 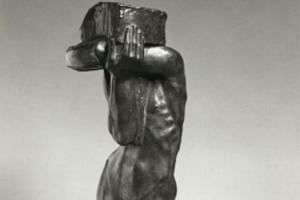 The later returns to The Fountain in the 1930's not only miss the starkness of form, but also the complex meaning that distinguishes the original version. 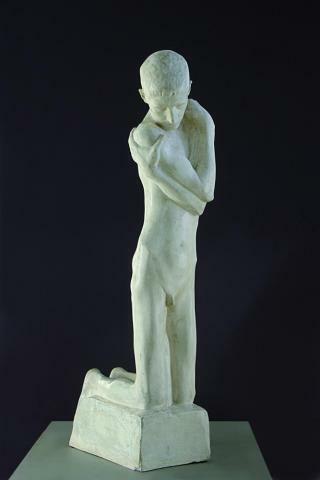 The sculpture of the kneeling youth, known as the Kneeling Youth from the fountain, is also frequently viewed as a stand-alone sculpture and is undoubtedly the prime example of sculpture with which the work of Minne is identified. There are executions known in plaster, bronze and marble. With a stark, stylised delineation and clear simplification of form, Minne anticipates the art that originates around and after 1900 in Vienna. We also find naked, protracted figures in the symbolist work of Klimt, Schiele and Kokoschka, as the articulation of a new mystique and a new religiosity that is closely bond with eroticism and sexuality. With The Small Relic Bearer (KMSKA) from 1897 and The Kneeling Youth (large version) (Vienna, Kunsthistorisches Museum) from 1898, Minne varies the theme of the kneeling youth. In The Small Relic Bearer, Minne places more emphasis on the religious context than in the Fountain with Kneeling Youths. The combination of the bowed head and the carrying of the relic give the sculpture a sphere of resignation and religious introversion. 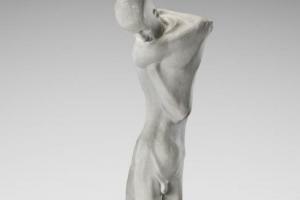 For this presentation, the artist is probably inspired by the Caryatide of Rodin. In 1929, Minne made a larger and more inspired version. Herein he also changes the position of the arms, by which the youth seems hide his face behind the left arm. Both the Museum of Deinze and the Leie Region and the Museum of Fine Arts Ghent have an identical, bronze version of The Large Relic Bearer.